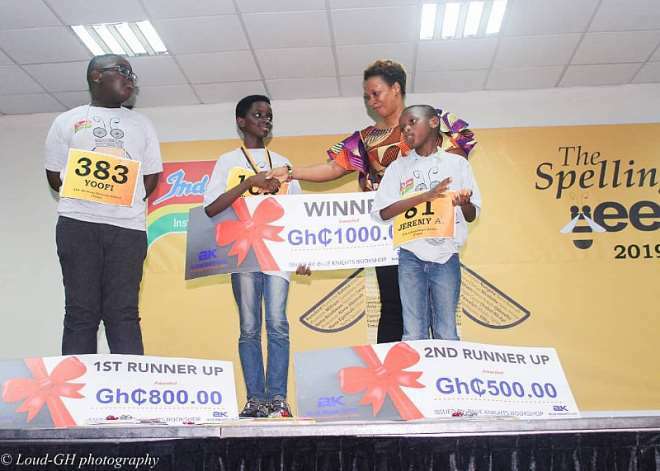 There was wild and spontaneous jubilation as the 13-year old Grade Eight pupil of DPS International Ghana, Kwabena Adu Darko-Asare, emerged the overall winner of the 12th edition of the National Finals of The Spelling Bee held on 2nd Feb 2019. 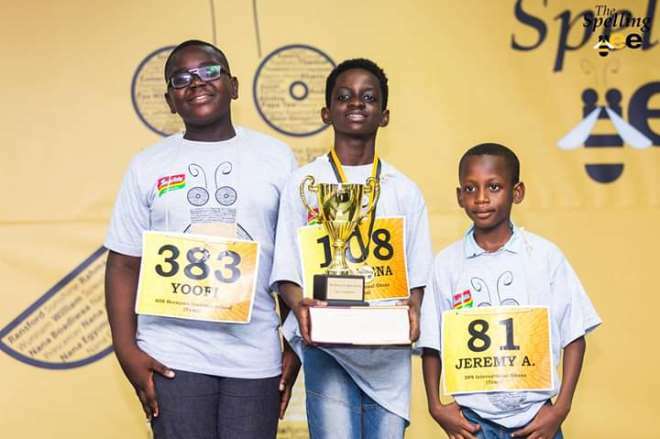 It was much more joy for the DPS International Ghana as a Grade Four student from the school named Jeremy Baffour Agyei, aged 9 was declared the 2nd runners up. It was a thrilling experience for the fraternity of DPSI to lift the trophy and bring it back home after the hiatus of three years. It is the fourth time DPS International Ghana has grabbed the most coveted trophy since the edition of 2013. Kwebena Darko Asare, a student of grade VIII topped the Vocabulary round scoring 91 out of 95 closely followed by Denielle Adzanku, Raj Mukesh Thakwani and Akshaya Lakshika of the same school- DPSI among the toppers in the same vocabulary round. It was a long day and a fierce battle full of anxiety and suspense as students from across the country converged on one of the auditoriums of the Accra Digital Center on Saturday February 2, 2019 to compete for the ultimate title which comes with a lifetime opportunity of representing Ghana and Africa at the world stage. The competition saw 380 students from all around Ghana and this humongous number gradually trickled down to 16 spellers in Round 4 with Kwebena, Raj Mukesh Thakwani, Jeremy and Akshaya still going steadfast as they tackled challenging words, but Kwebena showcased his mastery of the language with the correct spelling of words such as acyclovir. As the rounds dragged on, the pool whittled down and finally, Kwabena emerged as the winner after correctly spelling *Baldenfreude*which means Satisfaction derived from the misfortune of bald or balding individuals. 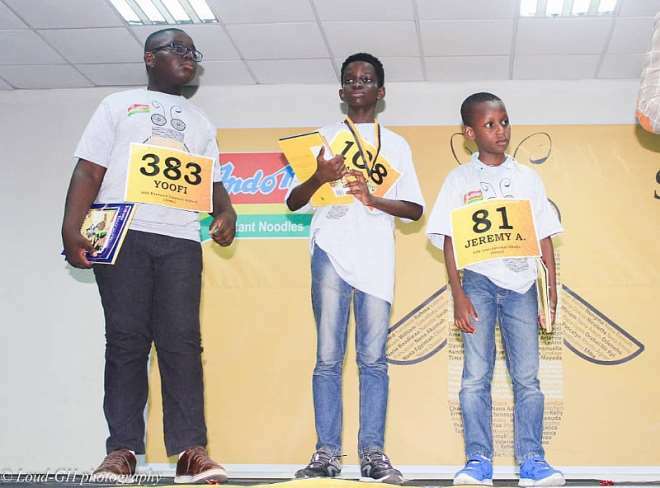 Jeremy settled for the position of the Second – Runner Up. .
A total of 14 students represented DPS International at the Ghana Spelling Bee and put up impressive performances. Seven out of the 14 students made it through to the 4th round and more than two made it to the fifth round but crashed out and only two made it to sixth round which was the final round of the competition. 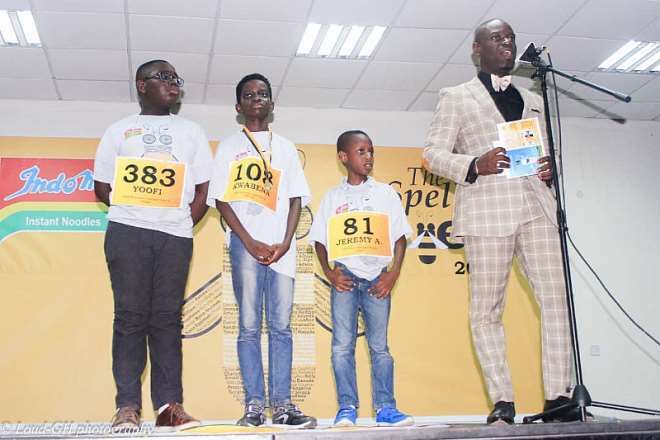 The Spelling Champion of Ghana 2019, Darko-Asare is expected to represent Ghana and Africa at the 92nd Scripps National Spelling Bee in Washington DC for which he was presented with a South African Airways return ticket. He received as his winning prize also, an Ghc 5,000 from the organizers, Ghc 1,000 worth of Blue Knights Bookshop vouchers, a fully-installed Explora Decoder with six months subscription from DSTV, a one year subscription to Merriam-Webster Unabridged online dictionary, Indomie and Voltic products, Ghc 500 worth of KFC voucher, a golden trophy, among others. The 2nd runners up took home prizes such as a DSTV decoder, Ghc 500 worth of Blue Knights Book vouchers, Indomie and Voltic products, Ghc 500 worth of KFC vouchers, a package from Akai House Clinic. Darko-Asare took over from Shifa Amankwa-Gabby, the 2018 champion from the Ashanti Region who told the gathering at Saturday’s contest that she had the opportunity to meet President Akufo-Addo, the Asantehene Otumfuo Osei Tutu II and the immediate-past US Ambassador to Ghana, Robert Jackson in her capacity as Ghana’s representative in the Scripps Spelling Bee. The Director of DPS International, Mukesh Thakwani who attended the competition which started from 7:30 am to 6:00 pm was overwhelmed with joy as his student was crowned with the championship title. He went on stage together with other officials of DPS international to congratulate the brilliant speller as well as the 2nd runner up. Mr Thakwani told the journalists on the sidelines of the celebration that DPS International has always strived to get the best out of its students and has made them realized the importance of taking their lessons seriously. He recounted that DPS international students have over the years continued to make the school proud, and have excelled in interschool and international programs and competitions. A few of the schools that participated in this year’s competition included Day spring Montessori School, SOS Hermann Gmeigner School, Tema Parents Association School, Ridge School, Galaxy International School, Faith Hill Community School, among others. Meanwhile, the Charity wing of DPS international, DPSI Care Foundation, has donated an amount of Ghc 5,000 to the Tetteh Ocloo State School for the Deaf as one of their students named Godsway made it to final round. The President of DPSI Care Foundation, Vishal Mukesh Thakwani told the journalists that the performance of their students was impressive, and as a result, the Foundation deemed it necessary to reward the school. According to the Chairman, the amount was intended to motivate the students with hearing impairment to work hard academically. The Spelling Bee is organized yearly by the Yong Educators Foundation (YEF), a nongovernmental organization that promotes education and literacy in Ghana. The Spelling Bee targets students between ages 8 & 13 and it teaches them how to use the English language effectively.